More than 2,000 gather at former Japanese American concentration camp. Rev. Al Tsuyuki conducts a Shinto blessing in front of the memorial monument in the camp cemetery. Concern over the decisions coming out of the newly elected Trump Administration dominated this year’s Manzanar Pilgrimage program, where more than 2,000 people turned out. 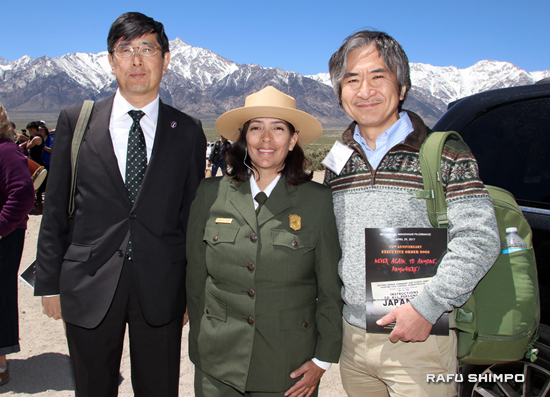 The annual pilgrimage was held on April 29 at the Manzanar National Historic Site in Inyo County. 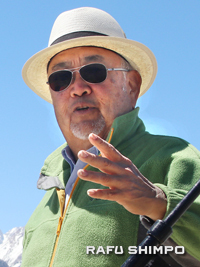 Warren Furutani, keynote speaker and co-founder of the Manzanar Committee, pointed to the number of executive orders coming out of the White House. Former Assemblymember Warren Furutani was the keynote speaker. In fact, on April 26, three days before the pilgrimage, Trump signed another executive order directing the secretary of the interior, who oversees the National Park Service, to review the designation of national monuments under the Antiquities Act of 1906. Manzanar Superintendent Bernadette Johnson, however, assured The Rafu that Manzanar would not be affected. “Manzanar won’t be re-examined because we were congressionally delegated,” she said. However, if a government shutdown is not averted later this week, Manzanar will be impacted. “If there’s a lapse of appropriations, no government agency can operate, but for now, we have the stopgap measure so we’re continuing to operate as normal,” said Johnson. Furutani further discussed the work of his mother-in-law Aiko Herzig Yoshinaga, who found the only existing copy of the final report written by Gen. John DeWitt that proved that there had been no “military necessity” to imprison people of Japanese descent living on the West Coast. Herzig Yoshinaga’s discovery at the National Archives during the early 1980s helped to vacate the wartime conviction of Fred Korematsu, who had been arrested for refusing to comply with the government’s order to enter a U.S.-style concentration camp in 1942. Because Korematsu’s conviction was vacated and not nullified by a constitutional amendment, new legislation introduced by Congress, or a Supreme Court ruling on a different case, Korematsu’s case can still be utilized to decide future cases, noted Furutani. “The Korematsu decision is still on the books,” said Furutani. “It sits around like a loaded gun, a loaded gun aimed that whoever is being scapegoated at that particular time for whatever political problem may exist, so sisters and brothers, the works not done. Sisters and brothers, the checks and balances that is the most important in a democratic society is the check that the people put on its government. Herzig Yoshinaga, who is in her 90s, was able to make the pilgrimage with Furutani and her daughter, Lisa. 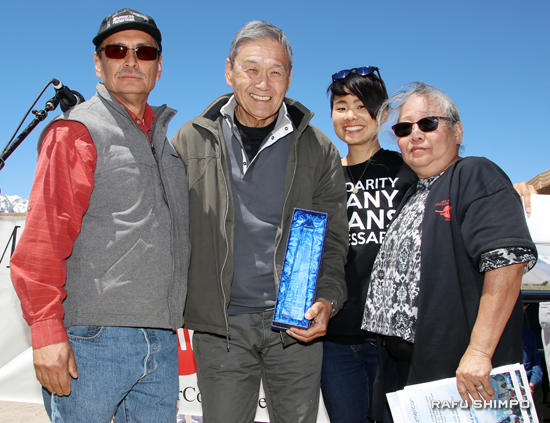 Alan Nishio, another former Manzanar prisoner who was born at Manzanar, was awarded the Sue Kunitomi Embrey Legacy Award, informally known as the “Baka Guts” award, referring to the incredible amount of courage, verging on stupidity, that is put forth. Honoree Alan Nishio (second from left) is joined by Bruce Embrey, Traci Ishigo and Jenny Chomori. Nishio noted the hard-won battles that were fought to win redress for Japanese Americans imprisoned in the U.S. concentration camps during the war. Like Furutani, Nishio urged attendees to take action. Ironically, the Japanese American community has had a long history of suppressing the experiences of those who had challenged the government’s discriminatory policies during World War II. While this is the 75th anniversary of the signing of Executive Order 9066, Asmaa Ahmed, policy and advocacy coordinator for the Council of American-Islamic Relations, noted that another executive order was affecting their community. 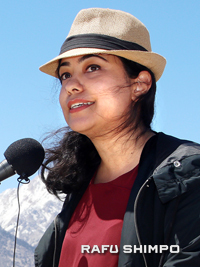 Ahmed noted that although Manzanar represented a dark period in American history, she was also encouraged by the history of Manzanar. Assemblymember Al Muratsuchi with Bruce Embrey of the Manzanar Committee. And although Embrey noted that it was a victory to celebrate the 25th anniversary of the establishment of the Manzanar Historic Site, he, like the other speakers, urged the public to stay involved. “Our celebration of our victory is tempered by the knowledge that we must remind ourselves of the fragility of our democracy,” said Embrey. “We must remember that the democratic principles enshrined in our Constitution must be defended at all times, but especially during times of fear-mongering and demagoguery. 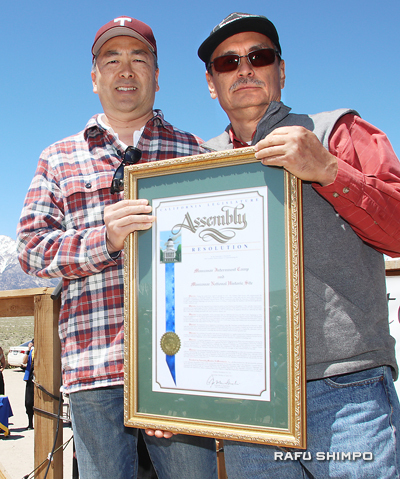 Embrey also accepted a resolution on behalf of the Manzanar Committee from California Assemblymember Al Muratsuchi. Muratsuchi shared that this was his second time participating in the pilgrimage but his first time bringing his wife and young daughter. “On this 48th annual Manzanar Pilgrimage, I want to thank the Manzanar Committee for organizing all of this and bringing us all here on this 75th anniversary of the signing of Executive Order 9066,” said Muratsuchi. Over the years, more Japanese nationals have come to attend the Manzanar Pilgrimage. This year, there was a historic first with Jun Yamada, consul general from the San Francisco office, participating in the pilgrimage, along with Akira Chiba, consul general of the Los Angeles office. Chiba, who assumed his post in July 2016, continues the legacy of his predecessor, Harry Horinouchi, who participated in the Manzanar Pilgrimage. From left: Consul General Akira Chiba from Los Angeles, Manzanar Superintendent Bernadette Johnson, and Consul General Jun Yamada from San Francisco. In addition, there was a contingent from the Japanese Chamber of Commerce of Northern California and the Japanese Business Association. Yamada, who attended last year’s Manzanar Pilgrimage as well as the Tule Lake Pilgrimage, noted that since last year’s Manzanar Pilgrimage several historic events had occurred, including President Barack Obama’s visit to Hiroshima, with Prime Minister Shinzo Abe reciprocating by traveling to Pearl Harbor. Shinya Imai, a JCC of Northern California member, said another member who had attended last year’s pilgrimage had encouraged him to make the trip this year. Growing up, Imai said he learned of the World War II camps, not at school but through a Japanese-language TV series that aired about 38 years ago. “I saw the show during my childhood and I saw it as just a kind of history but now that I’m here and I’m learning about how the people overcame difficulties, it’s very real and I think it is such a great thing,” said Imai. 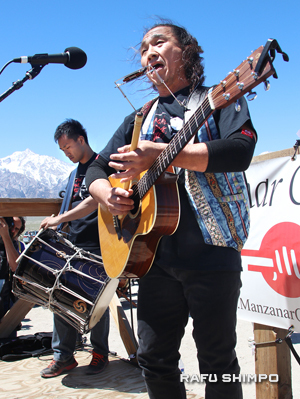 Musician Ken Koshio, who moved from Japan to the U.S. in 1998, has become a fixture at the Manzanar Pilgrimage. Even when he moved from Los Angeles to Arizona in 2004, he has been participating in the pilgrimage. Koshio noted that when he arrived in the U.S., he was looking for a spiritual connection through music but he felt the blues and rock ’n’ roll were not his roots. He finally felt rooted when he met Sue Kunitomi Embrey and met other Nikkei artists such as traci kato kiriyama and was introduced to the Japanese American experience in the U.S. This spiritual connection keeps Koshio returning each year, and this year, he wrote a song, “EO 9066,” in recognition of the 75th anniversary of the signing of the presidential order.